All-Star Fruit Racing is a clever parody, first and foremost. When you’re entering a genre (the kart racer) where you know that you’re going to be instantly compared to something of the sheer prominence of Mario Kart, you surely know that any license that you might pick up will seem tame by comparison. Such is the depth of the roster that Nintendo maintains that even its closet rivals can’t really compete. SEGA has taken a red-hot go at it with its Sonic kart racing line, but even there the developer has had to rely on characters like Football Manager. The completely dull and personality free Football Manager. It’s truly staggering to think just how much depth you need in your rosters to be able to build something with wall-to-wall beloved characters as Nintendo has on hand for Mario Kart. The best solution? Go with something ridiculous and license-free, like fruit. Everyone has their favourite fruit. I’m a kiwi fruit boy. You might be a pineapple girl. We can duke it out to decide who is (objectively, naturally) the bestest fruit. It’s hilarious. GO KIWI! All-Star Fruit Racer is actually very charming. 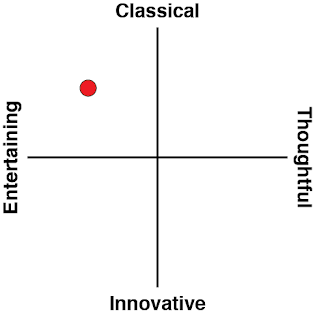 It’s bright, colourful, happy, and you’ll be smiling while you play it. 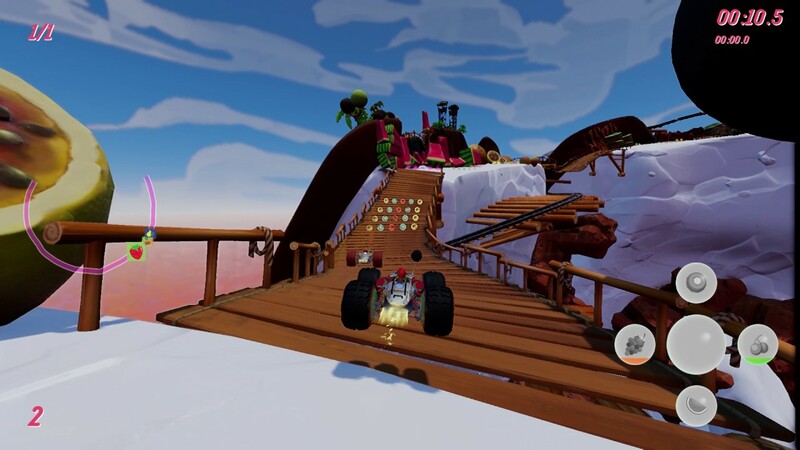 The developer didn’t have much by way of character to build on, so the racers can come across as a bit nondescript, but this is offset by the vibrant and meticulously well-designed tracks, which are a real hoot to hoon around. It’s clear that the developer spend a lot of time sitting down and deconstructing what has made the best Mario Kart tracks so good over the years, and carefully structured their own tracks around those same principles. And then the team took the power-up system, which is so essential to a kart racer, and managed to do even better than Nintendo did. 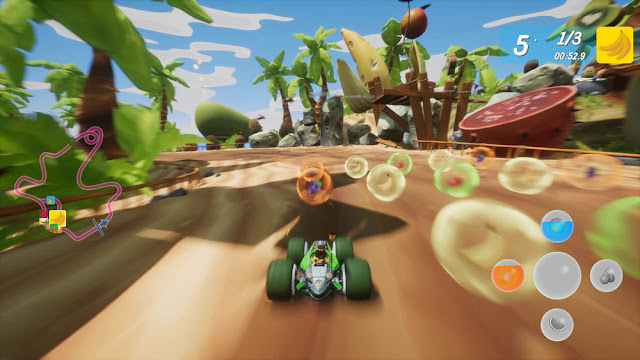 All-Star Fruit Racing has a delightful system whereby fruit that you pick up along the way will contribute to one of a series of “bars”. Once any bar is filled, you’ll be able to use the weapon that it’s associated with. Fill up a couple of bars and the weapon will be powered up, and fill them all up and you’ll get your character’s super-powerful weapon. I love this system, because it removes some of the ridiculous reliance on the most offensively banal idea of “luck” that has been such a plague to the Mario Kart series. By that I mean the players at the back are all-but guaranteed to get the best weapons by picking up a box with a "random" powerup in it, making it really easy to catch back up and ensuring that it’s very difficult for a racer to win on skill. Mario Kart’s approach to items is so arbitrarily focused on giving everyone a chance of winning, that trying to play with skill feels almost like it's a waste of effort. 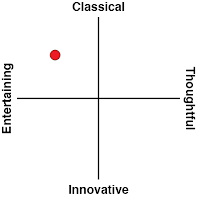 As such, I find those games difficult to play over longer periods of time. All-Star Fruit Racing actually fixes that by making the powerups themselves part of the skill – which power up to you aim for, and do you try and hold on to it to power it up, or use it immediately? Sadly not every track uses that system and sometimes you’re stuck with the same arbitrary “random” weapon-in-a-box nonsense that Mario Kart gets up to. Worse, the AI is so damned aggressive in this game. Kart racing fans will be familiar with a term called “rubber-banding” whereby the AI is designed in such a way that somehow the nearest racer to you is always just behind you, no matter how well you drive. If you manage to shake them off with a well placed item, they somehow seem to get a burst of speed and end up right behind you again. This rubber-banding has plagued kart racers since the original Super Mario Kart, and it’s a present in All-Star Fruit Racing too, coupled with a love of walloping you with weapons at the most inopportune moments. This issue is most pronounced in the single player modes, of course. All-Star Fruit Racing is saved from becoming too frustrating – just – by virtue of how much there is to do in the single player mode. The developer has done a great job of giving players plenty of different objectives and conditions to keep the core racing variety strong, particularly in career, and that helps stave off any impression that the game is a grind. 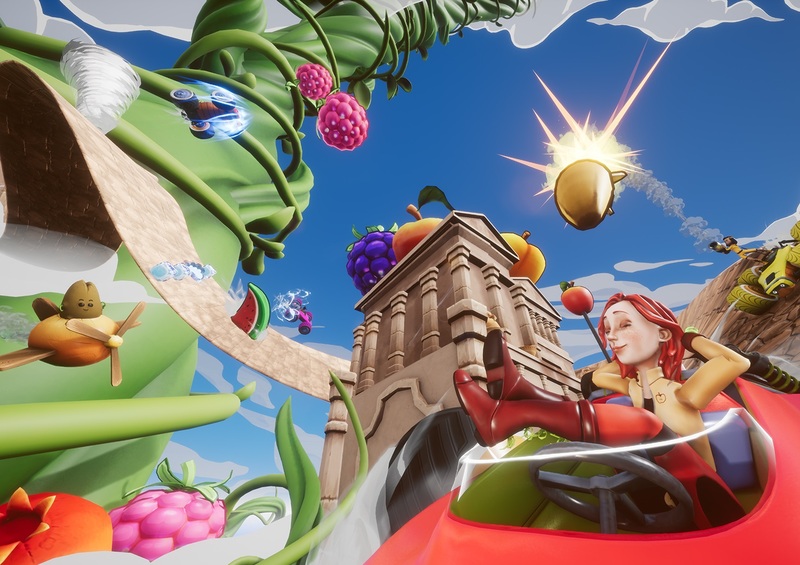 Make no mistake, while a title like “All-Star Fruit Racing” might sound like something truly budget, there’s more than enough raw content in there that it feels surprisingly premium. It’s the multiplayer where the longevity will come from though, and All-Star Fruit Racing gets everything right that it needs to there. The racing action itself is smooth and slick, with the standard ability to get a speed boost from power sliding well giving players the room to get very skilled at the game. Younger players might be put off slightly by the speed with which the game runs – it does feel slightly faster and less forgiving than Mario Kart – but the tracks often have splits and alternative routes which helps to reward exploration and experimentation. The only downside is that the weapons aren’t as memorable as in some of the other kart racers. The blue shell from Mario Kart might be the most frustrating powerup ever invented, but because we’ve all gone through the experience of having a race lost to one, there’s a shared experience in there that, coupled with the colourful and infuriatingly cute design of the weapon itself, makes the blue shell an institution and something that it would be impossible to picture Mario Kart without. All-Star Fruit Racing’s weapons get the job done, but there just isn’t that same sense of fun in lobbing one at someone. 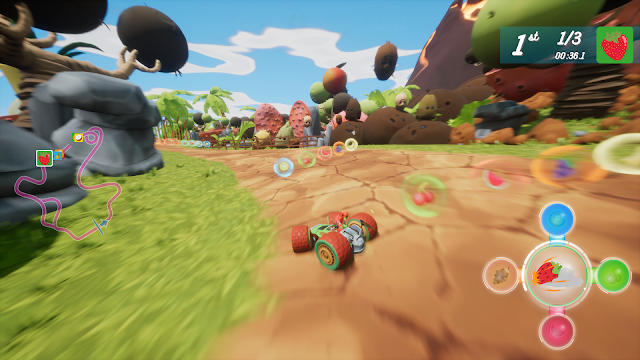 For a first attempt at a kart racer, All-Star Fruit Racing shows that the team behind it is talented, and they know how to make a genuinely fun game. There’s a lot of joy involved in playing this one, and it’s an ideal party racing game, particularly on the PlayStation 4, where there’s no Mario Kart equivalent to reach for. If it wasn’t for the infuriating AI, I’d even argue that All-Star Fruit Racing takes a step forward in a genre that Nintendo itself is almost painfully conservative about.